Young Tristan of Hamilton Twp. 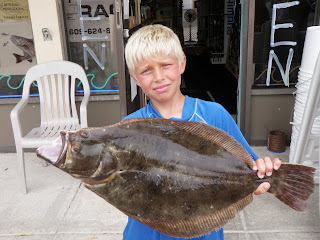 NJ fished with his grandpop and dad Wednesday July 20, 2011 in the bay behind Strathmere. Where he landed this Doormat flounder it tipped the scale at 5 Lb 15 Oz and measured 25 1/2 in. There were also 3 other nice keepers in the box. Tristan got this beauty to bite on what he called secret bait, after much begging I was able to get him to tell me what the secret bait was, a fresh strip of sea robin. Sea robin can be a great bait for the big flatties not to mention that they are good for dinner themselves. 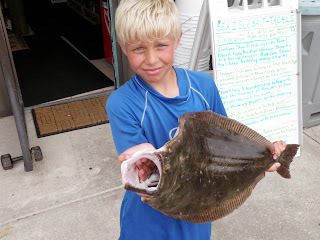 The other keepers were landed on chartreuse Gulp!, mackerel and live minnows.